If the wire cage is left on a transplanted tree, is it bad for the tree? This may be the most hotly debated topic in the landscaping industry. And the answer is not a simple yes or no. There are so many factors that impact tree development- soil drainage, fertility, planting depth, irrigation- that often it is hard to determine if leaving a wire care on a tree is the primary reason for decline. There are many landscape professionals that have decided through experience or research that the wire basket must be removed from the tree in its entirety. Other professionals claim that the wire basket quickly rusts away and does not interfere with root development. I have developed a position that the wire basket should be partially removed from the root ball to ensure that the tree will thrive. Over the years, I have provided landscape consultations throughout the Lowcountry. Many of these landscapes were installed 3-5 years earlier and show signs of tree stress. I find that once I start to dig around the base of a tree, the wire basket and burlap are often still completely intact. Often, thick “seatbelt” strapping covers the top of the root ball. This is not a properly installed tree. And because it took more than a year for the symptoms caused by poor planting to show up, the person who planted the tree is absolved from responsibility and the landscape maintenance company is wrongly blamed. I see this over and over. And the wire baskets contribute to the reason these trees fail. Wire baskets are designed for the transportation of field-grown trees and shrubs. These trees were grown in the ground without this cage prior to being spaded and would prefer to grow without this cage later. Wire baskets are horticulturally important because they allow large trees to be moved to a new location while keeping a portion of the soil and roots intact, but once they are moved, a portion of the basket needs to be removed. SHOULD THE ENTIRE WIRE BASKET BE REMOVED? Most industry associations, including the International Society of Arborists and the U.S. Forest Service recommend removing wire baskets, burlap and strapping from field-grown trees. And research from land grant universities supports this recommendation. Wire baskets can take more than 30 years to rust and degrade in the soil. During that time, large anchoring roots can become girdled when they expand within the openings of the basket. This restricts the uptake of water and minerals from the roots, causing the limbs to die back from the tips. Trees grown in burlap-lined wire baskets are also prone to root girdling. This is a common problem with plants grown in containers because the roots cannot naturally grow away from the trunk, but are instead forced around the interior of the container. As these roots expand, they compress on the trunk of the tree. Again, this reduces the uptake of water and minerals from the roots. When the burlap does not quickly degrade, it acts like a container and keeps the roots from growing away from the trunk. Girdling roots not only cut off the water supply to the leaves, they also make a tree more prone to lodge from the soil. Trees left in wire baskets are often deeply planted. 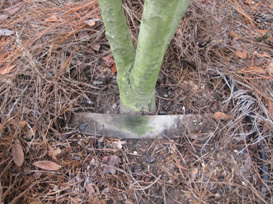 When trees are dug and caged, the surrounding soil can get pushed up around the trunk of the tree, covering the root flare. This means that even if the tree is planted even with the surrounding grade, the tree is actually too deep. Wire baskets can be hazards. When wire cages are left in place, they often protrude above the soil line, especially after a few years as the surrounding grade settles. The exposed wire can damage mowing equipment. And from personal experience, it can be a trip hazard. Many times, I have gotten my foot caught in the loops of exposed baskets. 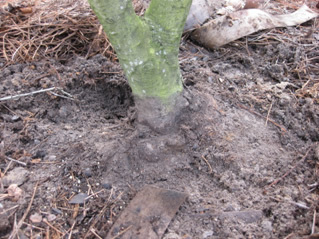 First, find the natural root flare on the tree and remove excess soil from around the trunk. Once you have determined where the first true roots are located, dig a hole to the proper depth. The root flare must be above the soil line after planting. Keeping the burlap and cage intact, set the tree into the planting hole and backfill halfway up the root ball to stabilize. Once the tree is set, cut and remove the strapping from the top of the basket. Cut or bend back the wire basket and burlap from the top half of the root ball, backfilling as you go. If the wire is bent back from the root ball, make sure that it is buried at least 12-inches below the soil line. Water the tree thoroughly to remove air pockets and settle the soil. Double-check to make sure that the root flare is not covered with soil. WHY IS IT IMPORTANT TO REMOVE THE CAGE ONLY FROM THE TOP HALF OF THE ROOT BALL? Most people think that the root system of a tree grows very deep and does not extend beyond the drip line of the canopy. In reality, other than some anchoring roots, the majority of the root system is located in the top 12-18 inches of the soil profile and extends well beyond the drip line. By removing the wire basket from the top half of the root ball, most of the roots that are responsible for water and mineral uptake are out of harm’s way. Not every tree that is planted with a wire basket fails to thrive. In fact, some trees are not affected by this at all. But from my experience, many of the large trees I am called to diagnose have straps and cages that are impeding root growth. And because it takes a while for damage to occur, most of these trees have been planted for 3-5 years. While the decline may be caused by the wire basket alone, it seems that improper planting depth plays an important role as well. Removing the wire basket from the top half of the root ball corrects both of these problems and prevents future tree decline and death. If you have trees in the landscape with wire cages and you are concerned about the current or future health of these plants, the best thing to do is remove the cages from the top 12-18” of the soil profile. Locate the root flare, remove circling roots and cut off the top portion of the cage. A certified arborist can properly perform these tasks to ensure that the tree can thrive.